Note: The Report of the SD61 Committee on Public Engagement is posted on the SD61 website. It includes 14 potential strictures on asking a question at a Board meeting if you’re a member of the public.. The draft bylaw changes regarding changes to how the Board meeting is run are being debated at OPPS meetings; that will continue until they’ve all been addressed and then will need to be approved by majority vote at a Board meeting. The Record Off The Record is my personal record of and commentary on Board and Standing Committee meetings in School District 61 (Esquimalt, Oak Bay, Victoria, View Royal and a portion of Saanich and Highlands ). 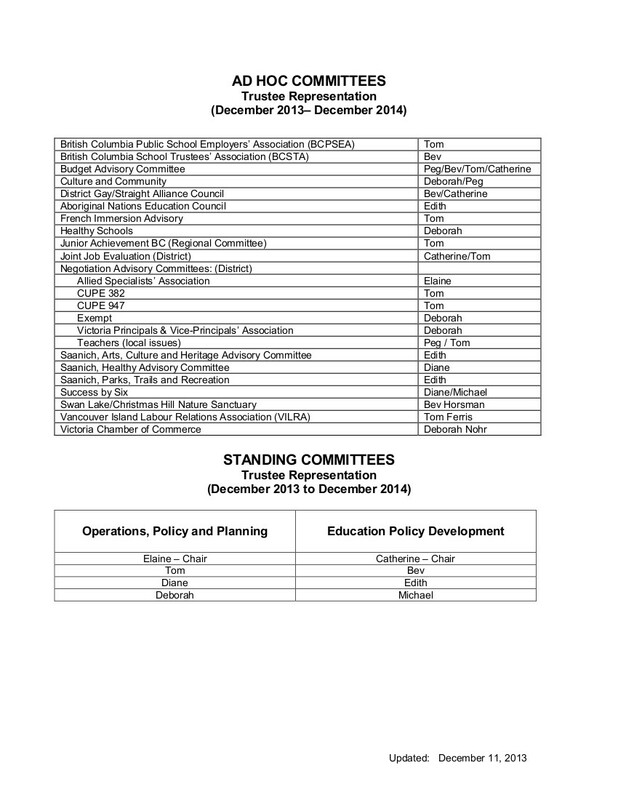 “Official” approved minutes of Board and Standing Committee meetings are posted on the SD61 website under the “Board of Education” menu; (Education Policy Development Committee is posted as “Education Meetings”; Operations Policy and Planning Committee is posted as “Operations Meetings”) generally one month after the meeting. Reports from In Camera meetings are posted on the Board meeting page as “Section 72 Reports”. “Section 72” refers to Section 72 (3) of the BC School Act which states “ A board must prepare a record containing a general statement as to the nature of the matters discussed and the general nature of the decisions reached at a meeting from which persons other than trustees or officers of the board, or both, were excluded, and the record must be open for inspection at all reasonable times by any person, who may make copies and extracts on payment of a fee set by the board.” Key word: “general”. Reports to the public in addition to the “general” report required from an In Camera meeting (posted on the SD61 website) are made if a motion to do so is made in camera, and carried by majority vote. The public meeting schedule is posted on District Calendar. Trustees are referred to by last name only for brevity; “the Board of Education of SD No. 61 (Greater Victoria) is referred to as “the Board”. Motions may be shortened and “subjunctified” but retain essential wording. No audio recordings are made of Standing Committee meetings, only of Board meetings. No record of how the audio recording decision was made, or any debate on proposed uses of and storage of the record appears to exist. The BC School Trustees Association states: “Trustees in some districts participate directly in union negotiations; in other districts the bargaining is left to staff and the board approves the negotiated agreements.” Trustees in SD61 do not have any part in developing bargaining objectives (as far as I know) , although we are responsible for them.